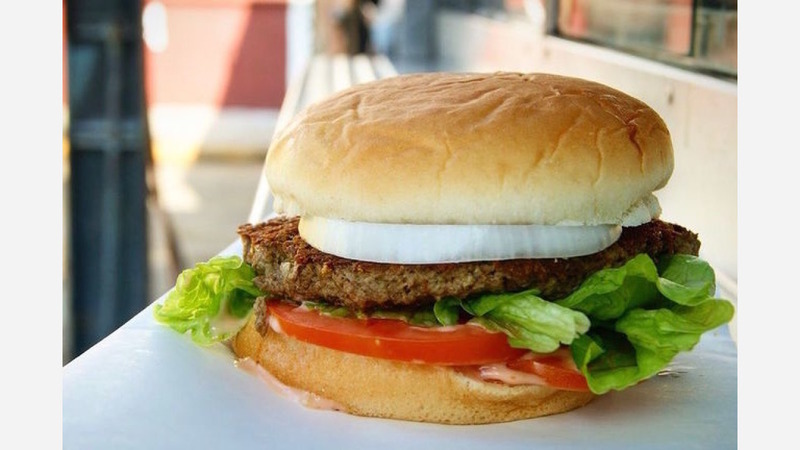 A new vegan food truck, offering vegan burgers, hotdogs and more, has opened its doors in the neighborhood. Located at 10058 Reseda Blvd. in Northridge, the newcomer is called Evolution Burger. This brand new food truck is using ingredients sourced from Impossible Foods to bring back "good ole fashioned junk food," according to business owner Dominique V.'s Yelp page. All of the meat and dairy products are plant-based and produced without using animals. A variety of classic and specialty Impossible Burgers are available, as well as a DIY option. Toppings include grilled onions, avocado, pineapple and a special Evolution Sauce. Not quite in the mood for a burger? Meatless hot dogs, tacos and tasty desserts are also at hand. The new arrival has already attracted fans thus far, with a 5-star rating out of 14 reviews on Yelp. JayCee P., who was among the first Yelpers to review the new spot on April 6th, said: "This place is delicious! EVERYTHING is vegan, so have no fear." Yelper Sanaz M. added: "The food tasted amazing! It was really delicious. The evolution sauce was great. I'm giving them 5 stars on taste alone. Honestly didn't taste vegan or fake." And M A W. said: "I am thrilled by this new Vegan food truck, just a wonderful addition to our area. I've been twice and the food is delicious and the service is good. "